Marcus Dolman is joint Chairman of the British Exporters Association (BExA) and is responsible for the Large Exporter issues and jointly responsible for the bank, insurance and other service provider members. 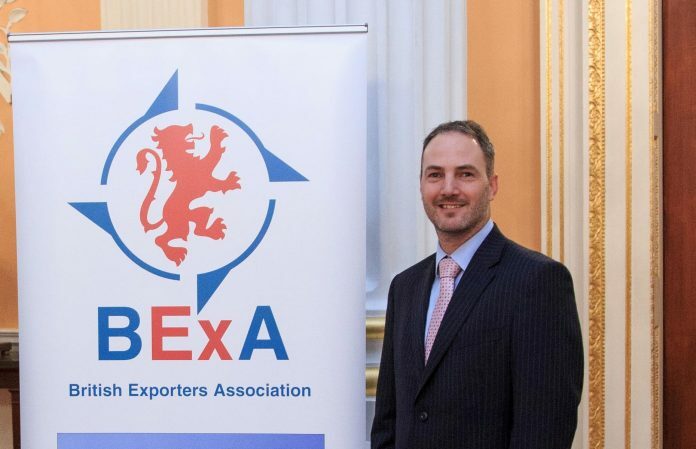 Dolman is assistant vice president—ECA & sales finance at Rolls-Royce, and he says his voluntary work to help exporters through BExA is both a passion and a vocation. Global-Britain: For the export community (and indeed the wider community), the current uncertainty about ‘life after Brexit’ seems likely to remain through the invocation of Article 50 and continue on until the UK leaves the EU. Are there any immediate steps that could be taken to stabilize or perhaps reduce this uncertainty? Marcus Dolman: Unfortunately not. The UK government can outline their plans for what they expect after Brexit, as can the EU27, but it is going to be a tough negotiation and no one really has clarity on what the post-Brexit UK and EU will look like. The UK government could pledge to UK business that they will be no worse off post-Brexit but, whilst welcome by business, this would pass the uncertainty of post-Brexit Britain onto the UK taxpayer. Global-Britain: Although there is some uncertainty today, many companies, on the other hand, have been polled as being optimistic about a future outside the EU—43 percent of manufacturing firms expect turnover to increase over the next year. If we can imagine for a moment that the uncertainty about our relationship with the EU has been dispelled post-Brexit, does the BExA share what is no doubt a qualified optimism, for trade deals outside the bloc? Are big opportunities waiting? Marcus Dolman: Whilst Brexit will be a huge complicated task to unravel ourselves from, BExA is optimistic for the future. Brexit gives the UK Government a once in a lifetime opportunity to shape the UK’s trading relationships with the world. The creation of the Department for International Trade is certainly a positive indicator that the current Government recognises the importance of trade to the future health of our economy. We rely on their ability to negotiate beneficial trade deals with third countries. Much has been said about the UK’s experience in trade negotiations, as all of the UK national negotiators worked for the EU, and concerns raised over the number of negotiators we had compared to how many would be needed, but DIT have been proactive in recruiting and have significantly bolstered their team. The effectiveness of the team is still to be seen but the problem has at least been recognised. Global-Britain: Does the fact that exporters’ confidence has been boosted by the fall in the value of sterling since the EU referendum vote (as overseas firms buying in foreign currencies find purchases around 16 percent cheaper in US dollar terms), is this fact as good as it looks, given that many export manufacturers have to buy their raw materials from abroad? Marcus Dolman: The fall in the value of sterling has given exporters a short-term boost. How long this will continue is uncertain given that the world’s commodity markets are priced in US dollars and therefore all of our raw materials got comparatively more expensive. This is feeding through to fuel prices and almost everything we export has a transport cost element. There are very few exporters that are not exposed to global commodities and therefore the current exchange rate advantage will not last forever. Global-Britain: Could you identify some key points of change that, post-Brexit, would benefit the export community? For instance would you want to see government make sure that small businesses have every tool available to ensure they are on equal footing with their foreign competitors? Firstly, the UK can revise the way it introduces businesses to overseas markets. The current situation is that all businesses pay for market introduction information regardless of the future level of success in that market. This is often prohibitively expensive and poor value for SME businesses. BExA has repeatedly asked government to review the way it distributes this information and to change to a success-based model whereby exporters would only pay for the market information after a certain threshold of success is reached. At present, there is a fee that starts at around £1,000 for one of these market introduction reports which, to a large company may be a drop in the ocean, but for an SME looking for its first exporting contract, that fee could be a big outlay for them. What we would like to see is something more in line with France’s and some other countries’ approach to this issue whereby the fee for market introduction information is success-based. Secondly, UK government can also improve the accessibility of overseas aid projects to UK exporters. A number of UK exporters have historically felt excluded from aid projects supported by the Department for International Development. This needs to change; the UK needs to support exporters and provide them the opportunity to access these projects. A simple link between the DIT and DfID departments to ensure sector-relevant exporters are made aware of aid projects and given the opportunity to bid would be a good start. Finally, more needs to be done to ensure banking facilities are available to all exporters. Large exporters often have a range of relationship banks to call on to fulfil financing requirements across the globe. This isn’t an option for SMEs who often have one banking relationship, and often only at the local branch business manager level. We at BExA hear many stories of SMEs struggling to access financial support for exports through a lack of knowledge at the bank branch level of what government support is available. Although UK Export Finance have a team of regional advisors working to improve this knowledge through the exporter community, there’s a need for a similar export-related knowledge and information stream to be flowing through the banking networks. Global-Britain: We know that BExA believes it is critical that government departments—namely the Department for International Trade, the Department for Exiting the European Union and other business-focused government departments—remain coordinated in order to drive the export agenda: do you see this happening satisfactorily or are you urging greater coordination? And if the latter, does BExA have a direct line to government? Marcus Dolman: We see it happening, slowly, but it is happening. We are still urging greater coordination, for example the DIT and DfID coordination I mentioned earlier still needs some work. BExA has a good line of communication with DIT and other departments but some still remain out of reach. We are, however, working hard to gain traction in these departments too, and this is starting to happen, for example, we’re now also talking to the Department of Transport and HM Treasury. Global-Britain: Would you agree that this cooperation and coordination of government departments relating to Brexit should already be a seamless part of the fabric of government rather than any kind of current challenge—if so, what are the main challenges facing the government? Marcus Dolman: Yes, it should, but UK government is similar in many respects to a large business. Those of us who have worked in large organisations will recognise the silo mentality that often arises. It seems to be human nature for people to focus on their own tasks to the detriment of the bigger picture. As in many large organisations, the UK government needs to address this by a change in culture in the civil service—no mean feat—to get the different departments taking a more holistic view of their responsibilities and interactions. Global-Britain: If we can look at the example of a British company, an SME, whose exports are currently a mainstay of the business—what should they be doing right now, what should their strategy be? Marcus Dolman: Primarily, keep doing what you’re doing—things aren’t going to change for at least two years. Depending on the industrial sector they are in and which export markets they are looking at, it may be worth exploring the possibilities outside of the EU. The Commonwealth and other ‘friendly’ nations may agree a trade deal with the UK quickly after Brexit is concluded—potentially offering new opportunities to exporters. Global-Britain: If we can now turn to the financial scene for a moment, today’s SMEs are struggling for banking support for export and trade finance products, because the cost to banks of performing the required regulatory checks makes SMEs uneconomical from the banks’ perspective. Can BExA make any recommendations to companies in this situation as to how to overcome what looks like a pretty daunting obstacle? Marcus Dolman: It’s a difficult situation for our SME exporters, KYC costs at banks are estimated to be £40k to onboard a client. If this client’s expected level of business is small then it makes it uneconomical for a major international bank to take on the client. Fortunately there are banks out there that are recognising this trend and are trying to target SMEs. There is also a raft of FinTech companies that may also be able to help. Unfortunately, UK Export Finance does not currently offer financing products with the FinTech companies but hopefully this will be resolved in the short to medium term. Global-Britain: In last year’s UKEF’s published product mix analysis, 10 UKEF products are listed, with continued annual improvement noted in all of these over the last six years, with the exception of Fixed Rate Financing (CIRR—credit with fixed interest rate). Fixed Rate Financing is shown to have remained static since 2010 with no improvements at all for UK companies. Can you comment on the continued absence of tender-to-contract foreign exchange risk cover and what is holding this back? And also how significant would an improvement in this product be for SME exporters? Marcus Dolman: BExA sees tender-to-contract FX cover as an essential product to help SMEs access international markets. With today’s weak sterling, an export contract priced at today’s rates may look very attractive but come contract signature in nine months’ time, who knows, sterling may have strengthened and the exporters profit isn’t looking quite as attractive as it once was. FX options are one way exporters can cover this risk but they are often prohibitively expensive and have a fixed end date that doesn’t help if a contract is delayed. FX Forwards are another option for exporters but, whilst cheaper than options, these leave the exporter with an obligation to purchase the FX currency and also lack flexibility. We ask UKEF to provide a flexible product to SME exporters to allow them to cover the FX risk on their tenders. BExA believes this is an essential product for SMEs. The problem we have is that SMEs as a whole don’t seem to be aware of this risk and consequently UKEF do not see a demand for the product. We believe that if UKEF designs and implements the product then exporters will flock to it. Global-Britain: Would you care to round off by giving us your ideal post-Brexit scenario? Marcus Dolman: The ideal utopian post-Brexit scenario would be tariff-free trade deals with as much of the globe as possible. Harmonisation of as many customs standards as possible to reduce the admin and time burden moving goods around the globe and free movement of skilled labour. I hope this comes to fruition, but I expect there will be many complications along the way and we’re beholden to how much politics interferes with trade to how good a result we will get.